Create an imaginary cave in the role-play area to inspire the children’s play based on fantasy themes such as a dragon’s den, a pirate’s hideaway and Aladdin’s cave. Drape dark fabric across a sturdy structure, for example, a climbing frame or playhouse. Alternatively, staple fabric to a display board and let it hang in rough folds to represent rugged rocks. Arrange a cluster of large floor cushions, cardboard boxes or tables in front of the rugged rocks and cover them in additional dark fabrics to create a safe and cosy den for a dragon. Decorate the cave to represent ‘Aladdin’s cave’. Hang spirals of shiny paper from the ceiling, stick colourful shiny shapes on the walls and sprinkle shiny confetti over the floor. Make a simple lamp by covering a 2D lamp shape with silver foil. Adapt the cave to create a pirate’s hideaway, for example, paint a sheet of fabric to represent a pirate’s flag, make child-drawn maps look old using teabag stains, and provide an upturned box or wooden crate for a pirate’s table. 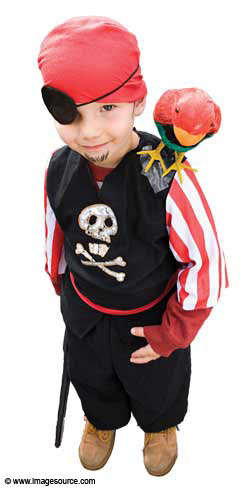 Scatter the area with pirates’ hats, headscarves and eyepatches. Cave role-play area; climbing frame or playhouse; large floor cushions; cardboard boxes or tables; dark fabric; shiny paper; shiny fabrics; toy or child-made lamp; large rectangle of black paper or fabric; thick white paint; wavy-edged paper or pages torn from an old map; wet teabags; wooden crate or box; pirates’ hats, headscarves and eyepatches.